This first chart shows the cumulative total of units sold since Q2 2007. This is the sum of all smartphones sold in the last 3.5 years. There are some interesting patterns here, but right now we want to focus on the installed base. 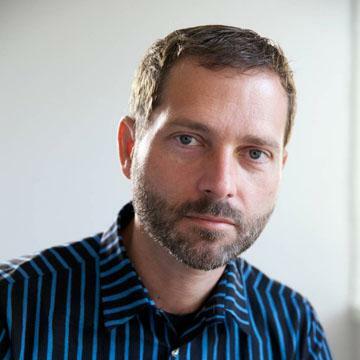 As of the last quarter, Nokia’s Symbian is likely to have 200 million in use. Apple may have about 85 million iPhones in use (this excludes iPod touch and iPads) and Android about 75 million. 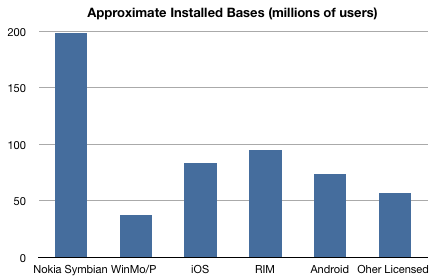 RIM is around 95 million and Windows Mobile less than 40 million. 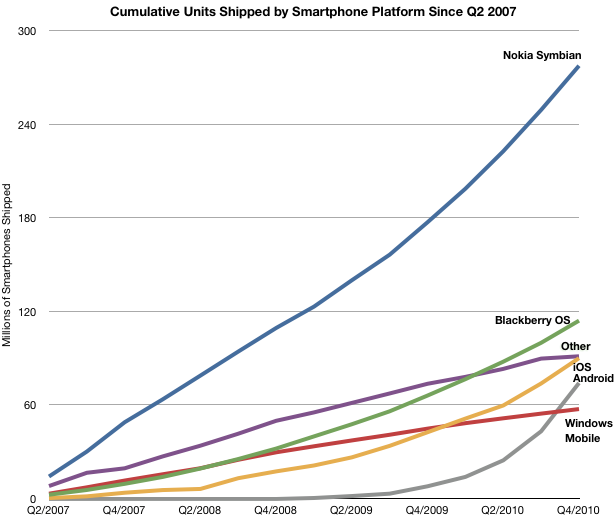 The bottom line is that there are about 5 Windows Phone users for every 1000 Symbian users. In other words, Nokia jumped from the “burning” 200 million user Symbian platform to the “ice cold” 1 million user Windows Phone platform. The disposal of such a large installed base must count among the largest divestitures in technology history and, when coupled with the adoption of the least-tested alternative as a replacement, elevates platform risk-taking to a new level. It may seem bold, but there is a fine line between courage and recklessness. I’ll do my own “dive” into the possible justification for this in a future posting.